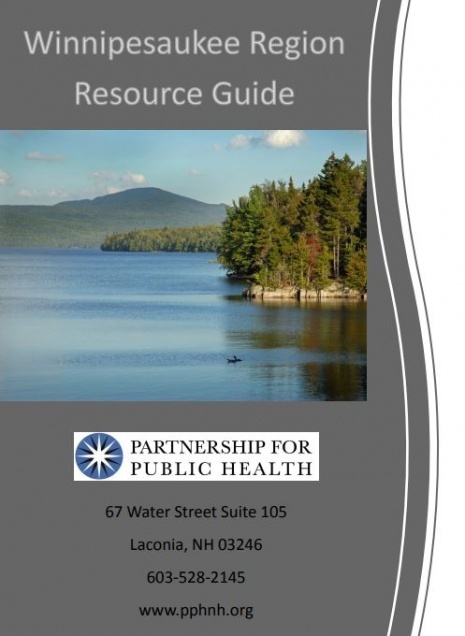 The Winnipesaukee Region Resource Guide is comprised of local and statewide services and resources that are available across the continuum of care. This guide includes services and resources in Prevention, Treatment and Recovery. It was developed by the Partnership for Public Health with support from the Partners in Community Wellness Team, a workgroup of the Winnipesaukee Public Health Council. The information provided in this guide is for informational purposes only. It is not an endorsement of any organization or the services they offer. While we make every effort to keep the information up to date, we make no representations or warranties of any kind, expressed or implied, about the completeness, accuracy, reliability, suitability or availability of any of the organizations or providers listed. Communities understand that substance use disorders and suicide are public health concerns requiring a community based approach of consistent and widespread prevention, early identification and connection to treatment and recovery support services to promote a culture of health and wellness. Decrease marijuana use among high school aged youth. Decrease alcohol use among high school aged youth. Decrease non-medical prescription drug use among high school aged youth and young adults. Help to build and sustain capacity and infrastructure around implementing best practices for suicide prevention and postvention for high risk youth and young adults. Goal 1-Reduce suicide incidence in the Winnipesaukee Public Health Region. Objective 3 (developmental)-Increase the number of people trained in Suicide Prevention, Postvention and/or Counseling on Access to Lethal Means (CALM) within key community sectors. Objective 4 (developmental)-Increase the proportion of media professionals who have received training in appropriate reporting of suicidal events following the national Reporting on Suicide: Recommendations for the Media. Objective 5 (developmental)-Increase utilization of postvention training and protocols (i.e. After a Suicide Toolkit, Media Recommendations) for first responders, law enforcement, emergency departments, schools and others who may be involved or affected by a suicide to reduce risk of contagion and promote healing. Objective 6 (developmental)-Identify key data sources and tools that may better identify high-risk populations and/or other trends which would inform suicide prevention efforts.